Madison Concert Ticket Giveaway: Dum Dum Girls | True Endeavors Presents: music, tours, tickets, mp3 downloads, concert pictures, videos, Madison WI. Critics have been raving about Dum Dum Girls ever since the release of their delicious, ear candy-laden debut, I Will Be, in 2010. The noisy hell raised by these California-based ladies on their newest record, this fall’s Only In Dreams, has inspired similarly gushing reviews. The band has been likened to “Chrissie Hynde backed by Hüsker Dü” (The Phoenix) and the album called “close to pop perfection” (The Associated Press). 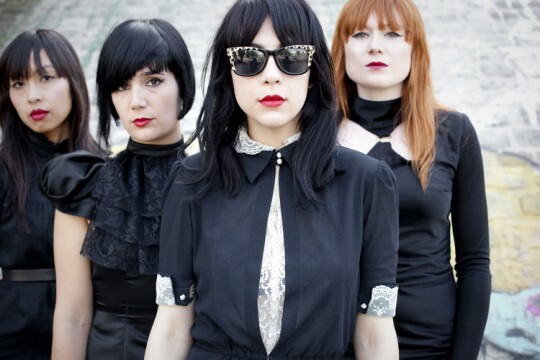 Dum Dum Girls will be hitting Madison next Thursday (October 13, 2011) for a show at the High Noon Saloon, and we’ve got your chance to win free tickets right here! Read on to find out how to enter to win. Very real things indeed: Dee Dee wrote “Hold Your Hand” immediately after her mother (the pretty lady on the cover of both the Dum Dum Girls’ self-titled 2009 debut EP and their 2010 debut album I Will Be) was diagnosed with what turned out to be a fatal illness, and it’s one of several songs on Only in Dreams that unsparingly trace her mom’s passing. Other songs spell out the emotional toll of separation from one’s lover, something Dee Dee had to deal with while she and her husband (Brandon Welchez of the acclaimed noise-pop band Crocodiles) pursued their own tour schedules. On several levels, Only in Dreams is a great leap forward for a gifted songwriter and an equally gifted band—it’s heavy, deeply personal stuff and surely unprecedented for this style of music, and that’s what gives Only in Dreams both its uniqueness and its gut-punch emotional impact. WIN A PAIR OF TICKETS: This one’s simple. With the title of the band’s latest record in mind, and because sometimes the best things happen after you close your eyes, we want you to tell us about a favorite dream of yours. Have your responses posted by Tuesday, October 11 at 6:00pm. A winner will be chosen and notified shortly thereafter. Good luck! Once, when I was in New York staying at my Grandma’s house I had a dream about peanut butter toast. I was walking through my Grandma’s kitchen with my friend Maria and I was eating this delicious peanut butter toast. I took a bite and decided it was extremely good so I went back in time to a few seconds before… and took the bite again. It might be because I don’t remember much of my childhood, but I have consistent dreams of hanging out with my grandparents if they were 20 years younger. Last night we went on a road trip through the southwestern US. Extremely pleasant dreams. i have dreams of a romantic and secret nature. sssshhhhhhh. I was very young when I had this dream, but I still remember it pretty well: I was in the dungeon of a castle with my sister because apparently we had done something that the king did not like. We sat there on our wooden stools quietly contemplating how to escape. A guard then came up and hit me on the back telling me to stand up and go down the hall for my punishment. I then woke up because I had wet the bed. Love that image, Kate! 🙂 The tix are yours. Congrats!